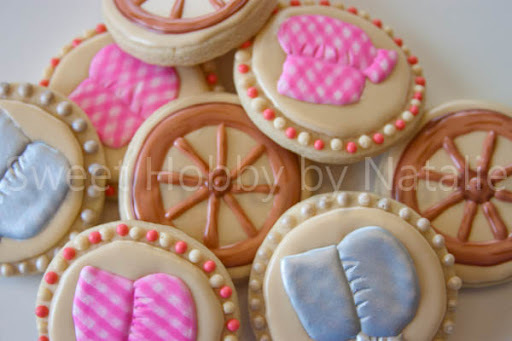 Sweet Shop Natalie: Happy Pioneer Day! Pioneer Day is an official holiday celebrated on July 24 in the state of Utah. It commemorates the entry of Brigham Young and the first group of Mormon pioneers into the Salt Lake Valley on July 24, 1847, where the Latter-day Saints settled after being forced from Nauvoo, Illinois. Parades, fireworks, rodeos, and other festivities help commemorate the event and the celebration is referred as The Days of '47. While the holiday has strong links to the LDS Church, it is a celebration of everyone, regardless of faith and nationality, who emigrated to the Salt Lake Valley during the pioneer era, which is generally considered to have ended with the 1869 arrival of the transcontinental railroad. So on with these cookies story. My cousin, technically my cousins daughter, I never know what that it officially called but when I just googled it it said that she would be my first cousin once removed. But seriously saying cousin if much easier. 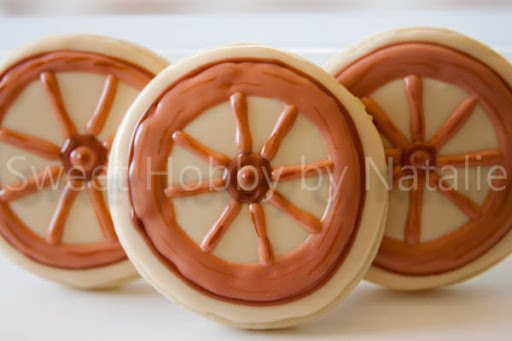 Anyway my cousin Camberly who lives in Colorado messaged me on Facebook and asked if I would make a couple dozen of cookies for her to take to their local Pioneer Day celebration. I said sure I could do it. She suggested wagons, wagon wheels, or bonnets. I choose to do the bonnets and the wheels. I choose to do a royal icing transfer for the bonnets and I want it to have the gathered look to it. 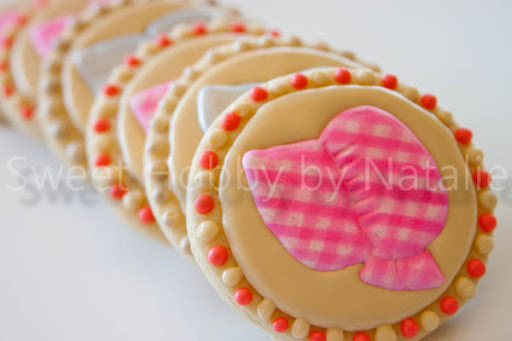 I was not sure how I would do that but while they the transfers were drying I indented one by accident and I thought that would be perfect to give it the gathered look and then I saw gingham cookies on Glorious Treats site a few months ago and thought they would looks so cute. My stencils stripes are more narrow though. Thanks Camberly for having trust in me, they were fun to do and I just love the pink bonnets! THose are so cute--love the bonnets! They were perfect. and delicious too. your very talented. everyone that saw them and ate them LOVED them.